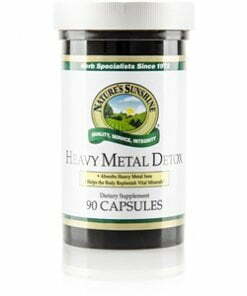 Nature’s Sunshine Heavy Metal Detox works to bind with heavy metals in the digestive system and remove them from the body. Half or more of United States residents face exposure to heavy metals, including lead, mercury, aluminum, cadmium, and arsenic, all found in manufacturing byproducts, pesticides, and even drinking water, dental fillings, or cooking utensils. Heavy Metal Detox supports the body’s natural cleaning processes to rid the body of heavy metals and to provide important nutrients. Cilantro, an essential ingredient in the formula, may work to decrease the body’s level of heavy metals. 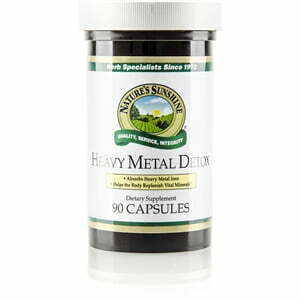 Heavy Metal Detox also includes N-Acetyl-Cysteine, apple pectin, sodium alginate, kelp algae, l-methionine, alpha lipoic acid, magnesium and pyridoxal-5-phosphate. Instructions: Take one capsule twice daily with a meal. Do not exceed recommended dose. If symptoms of headache, nausea, or diarrhea develop, reduce dosage and see your health care practitioner.